Oh were you looking for some inspiration to get into shape? Well maybe don't read the rest of this and definitely don't watch the video below. Because this 77-year-old grandma will put you to such shame you won't want to even look at that gym membership flier the Japanese delivery dude keeps attaching to my Seamless order. But seriously, Murphy seems like the most delightful (and slightly terrifying) woman, and her hard work has won her the 2014 Lifter of the Year award from the World Natural Powerlifting Federation. 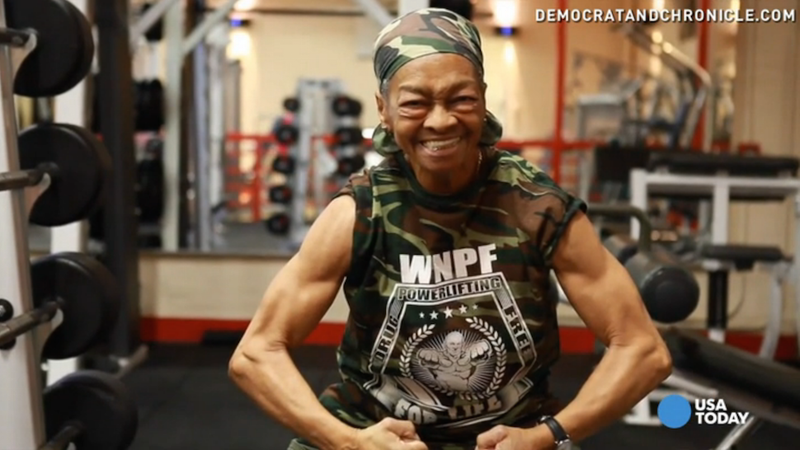 She also won in her division at the recent WNPF World Championships, coming first in power curls, and bench press competitions. Her motivation? "I never use the word 'I can't. I would just simply say, 'I will try.' That's the way I live my life, just trying to do my best every day." I need her to be my personal trainer. We all do.